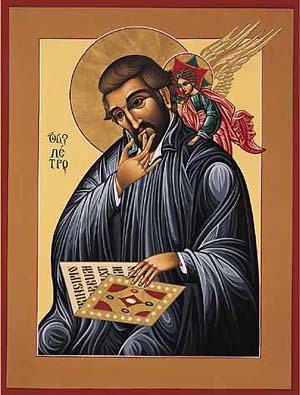 Saint of The Day: St. Peter Canisius. Secret Agent Man? “In 1565, the Vatican was looking for a secret agent. It was shortly after the Council of Trent and the pope wanted to get the decrees of the Council to all the European bishops. What would be a simple errand in our day, was a dangerous assignment in the sixteenth century. The first envoy who tried to carry the decrees through territory of hostile Protestants and vicious thieves was robbed of the precious documents. Rome needed someone courageous but also someone above suspicion. They chose Peter Canisius. At 43 he was a well-known Jesuit who had founded colleges that even Protestants respected. They gave him a cover as official “visitor” of Jesuit foundations. But Peter couldn’t hide the decrees like our modern fictional spies with their microfilmed messages in collar buttons or cans of shaving cream. Peter traveled from Rome and crisscrossed Germany successfully loaded down with the Tridentine tomes — 250 pages each — not to mention the three sacks of books he took along for his own university!” Read more here.